Akpabio's Wife Did Not Cause Any Security Breach During Aisha Buhari's visit | Welcome to Dare Lasisi's blog! Attention of the Senator Representing Akwa Ibom North West Senatorial district, Senator Godswill Akpabio and his wife has been drawn to a story making the rounds in the media purporting that his wife, Mrs Ekaette Unoma Godswill Akpabio caused a security breach at the airport during the visit of the wife of the President and First Lady of the Federal Republic of Nigeria, Mrs Aisha Muhammadu Buhari to Akwa Ibom State on Friday, December 14, 2018. They had come with a premeditated notion that the chieftains of the All Progressives Congress (APC) who were also at the airport to receive Mrs Buhari, were going to prevent the wife of the Governor from getting close to the President's wife. But it turned out to be a melodrama as no one prevented Mrs Emmanuel from receiving the First Lady. However, with the benefit of hindsight we understand that the frustration of the Akwa Ibom State Government may have stemmed from the stout refusal of the State House Protocol Officers to include a trip to the Government House, Uyo in Mrs Buhari's itinerary after an elaborate preparation had been made for her reception, including laying of red carpets. Having failed in hijacking the First Lady, they found a comfortable scapegoat in Mrs Akpabio. 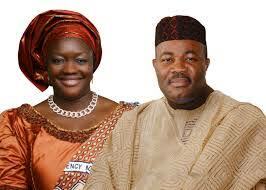 It bears repeating that Senator Akpabio's wife never caused any security breach at the airport. Purveyors of the fabricated story should desist from further dragging the name of an innocent woman in the mud, just to score cheap political points.